There is nothing uncommon about finding a mass spectrometer (MS) in the research labs of academia and pharmaceutical companies, or even in the clinical labs of major hospitals and academic medical centers. For decades it has been a valuable tool in these settings for the detection of small molecules and for immunosuppressant monitoring, along with its prominent role in pharmacokinetic studies in drug clinical trials. 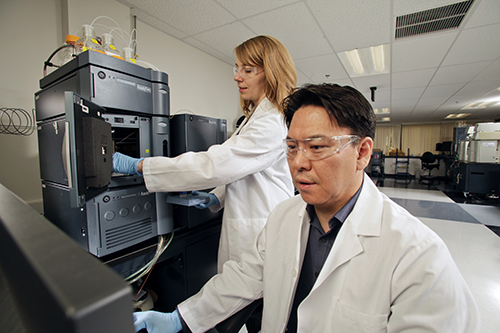 But today, due to significant improvements in the sensitivity and specificity of mass spec instruments, along with more powerful bioinformatics, the technology is playing an increasingly important role in the detection and analysis of metabolites and proteins that serve as biomarkers for a range of diseases (see page 28). These improvements in MS technologies have helped spur researchers working in a number of different areas including infectious diseases, automimmune diseases, and cancer, among others. “With the introduction of the orbitrap family of instruments, where you are getting both high sensitivity and high resolution, you can do both identification and verification with a simple instrument for PRM experiments,” said Vathany Kulasingam, Ph.D., a clinical biochemist at University Health Network, Toronto, whose work focuses on identifying protein biomarkers in ovarian cancer. “That has helped to almost revolutionize the way we approach our pipeline. While many larger academic medical centers may be using MS on a regular basis, its broader adoption in the diagnostics labs of health systems and larger hospitals may yet rely of future developments, Mylchreest noted. “Healthcare testing labs may be reluctant to adapt this technology based on high cost of initial investment, perceived complexity and the talent (specialized resources) required to develop and validate protocols,” he said.